Mary Zappetillo at the Emergency Medical Services Regulatory Board (EMSRB) provided us with Minnesota’s EMS “run numbers” for the years 2004-2012. The number of EMS calls in the state continues to increase at an average rate of 3.3% per year. 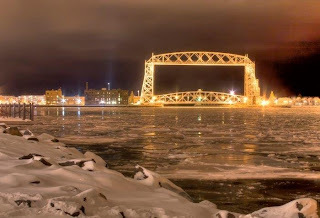 The yearly totals jumped from 459,934 to 600,765 during this 8-year period, and this trend is expected to continue as Minnesota ages. The state demographer predicts that by 2020, Minnesota will have more people over the age of 65 than it has in K-12 schools. More emergency runs mean more opportunities for injury. The LMCIT Loss Control team continues to see “patient handling” injuries on medical and accident calls as one area where responders get hurt. Unfortunately many of these injuries are the result of not only lifting, but lifting and twisting—and the resulting injuries (often to the lower back) are serious. Patients are seldom found on a level, flat surface or where they can be easily moved. And it may be anecdotal, but most of our first responders believe that their patients are not getting any smaller in size. The Rescue Lift in action. New Brighton Public Safety recently sent us a few lines from their overnight briefing. An officer handling a call of a “lift assist” used their portable “Rescue Lift” to safely lift a 300-pound man who had fallen in the bathroom. The officer got the man back on his feet with no injuries to anyone. 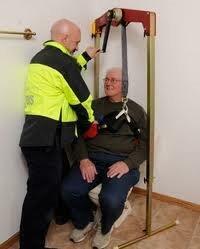 The Rescue Lift is designed for lift assists even when the patient is between the toilet and the bathtub. It is portable, and it is made in Minnesota. We are interested in hearing what your service or department is doing to prevent and reduce injuries during patient handling, and while helping your citizens on lift assists. Please call or send me an email with your comments or thoughts. The Training You Asked For—Brought to Your Door—And More! We'll be in Mankato on April 4. The annual League of Minnesota Cities (LMCIT) Loss Control Workshops start on March 26. The nine workshops will be offered at locations around Minnesota and include a full-day police track, although officers may attend just a half day. All of the classes are approved for POST continuing education credit. We have listened to your comments, read your surveys, and know that human resources (HR) is one of your toughest issues. The League’s HR department will present the first “HR Boot Camp for Law Enforcement.” In addition, the HR staff will be available before and after the session to answer your questions. The morning session starts at 8:30 a.m. with: “Things That Get Police in Trouble.” That is followed by: “What’s Really Driving Police Crashes?” and “Data Practices and Law Enforcement Data.” It will be a full day of useful and practical risk management training. We'll be in Duluth on April 10. For the first time this year, attendees to the police track will be receiving a Train the Trainer DVD in addition to the printed course materials in the traditional binder. The materials on the DVD includes videos, links, photographs, and discussion points to facilitate officers taking the materials back to their departments for “roll call” or in-service training. BCA manager Suzanne Cellettee said the new software catches the needed items as soon as the complaint is filed via the e-charging. “It is so hard for departments to go back and get the needed information later,” she said. 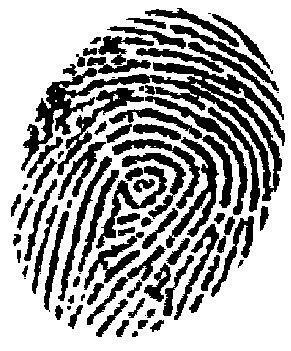 The new Fingerprint Lookup Feature keeps departments ahead of the problem, will increase the accuracy of the criminal history files, and keep criminal histories accurate. That is good risk management. 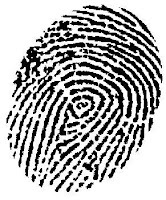 The BCA has asked us to help get the word out on Fingerprint Lookup. For more information, contact Carla Duellman at (651) 793-2424 or Suzanne Cellettee at (651) 793-2606. The script read at the awards ceremony started out: “Amidst a severe winter storm on December 9, 2012, Richfield emergency personnel responded to an unknown 911 call in the 7300 block of Garfield.” The call began when Richfield dispatcher Lynn Werner began receiving multiple 911 calls from emotional callers. She remained calm as she “filtered” out the information, determined what was happening, and got the location. 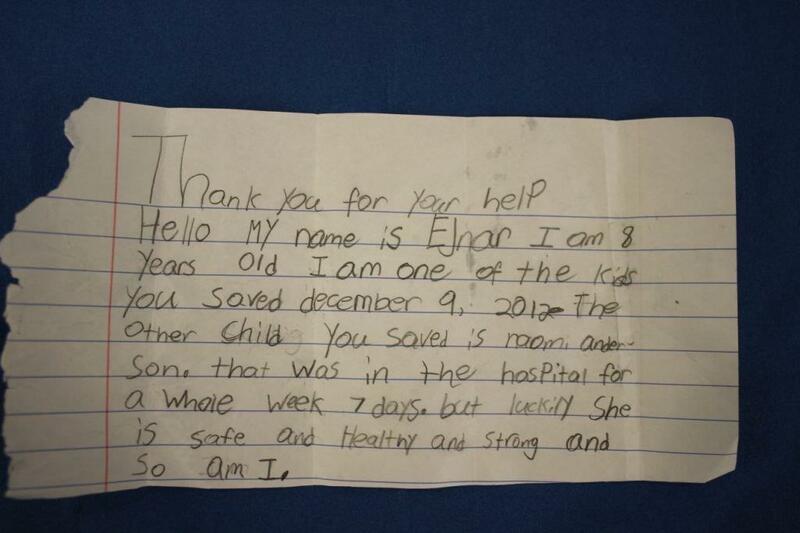 She was also immediately dispatching the responders. That is what people like Lynn do well. 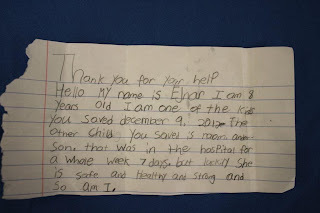 A thank you note from the girl who was saved. Officer Greg Peterson was the next to arrive. He assisted Kromschroeder until they were relieved by Richfield firefighters and HCMC medics. The council citation reads, “The children were transported to HCMC, where the boy was treated for hypothermia and the girl remained in critical condition in the pediatric intensive care unit for more than a week.” Both of the children have made a full recovery with no long-term health concerns. Recently this exemplary group of people gathered a second time to receive awards at a Richfield City Council meeting. Everyone was there, including the survivors. Sgt. Kromschroeder’s remarks were focused on the bravery of the citizens and the victims. On that day in December, they were all links in a chain that brought together values, commitment, training, and professionalism in an environment filled with danger and stress. And together, they saved two lives. Congratulations to the citizens and all of the responders. We also salute the City of Richfield for taking the time to acknowledge what they did on that snowy day in December.